Describing test-cases from business perspective using Behavior-Driven Testing (BDT) requires actions from a user's point of view. So those actions contain several interactions likes mouse-clicks or text-inputs. 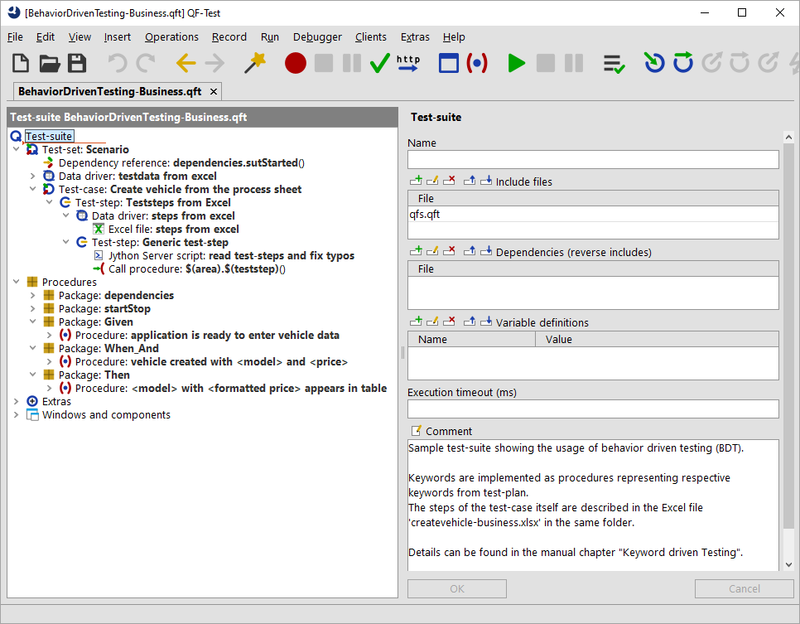 You can find a sample test-suite at qftest-4.5.2/demo/keywords/behaviordriven_business/ BehaviorDrivenTesting-Business.qft. The respective test-plan can be found at qftest-4.5.2/demo/keywords/behaviordriven_business/ createvehicle-business.xlsx. Please take care to copy the demo folder to a project-related folder first and modify them there. This approach uses the keywords Given, When, And and Then at the beginning of any sentence like the technical one. The provided test-suite therefore contains the packages Given, When_And and Then. In order to prevent annoying typos a Server-script read test-steps and fix typos formats any steps to lower case and tries to replace multiple blanks by one. This script is called directly before the procedure call of $(teststep).